Brunswick Song Project Take this space (Dave Brown / Matthew Lees / Julie McKinnon) This song was written for the opening of our updated church space and it would be good to sing it again this week, particularly as we are considering how we use the space for our Olive Way outreach program. *MV119 God our protector (John Bell) Simple chant "God our protector, keep us in mind, always give strength to your people. For if we could be with you one day in time it is better than a thousand without you" Could be used between a reading of the Psalm, or on its own with or without an instrumental bridge, and I think it would be good for kids. 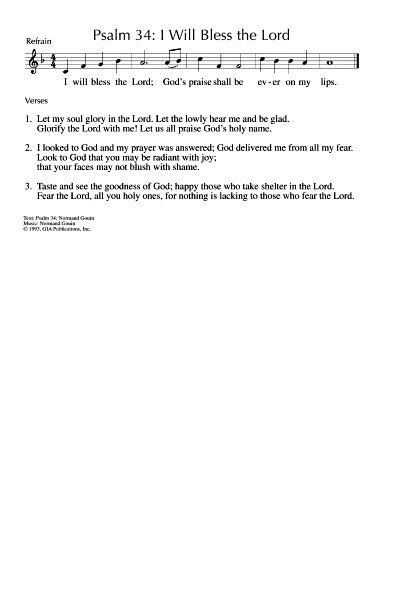 G(II)72 / GC77 Happy Are They (Thomas Porter) A simple refrain with cantored (or read) verses. The refrain also works as a round. "Happy are they who dwell in your house, O Lord". Sound sample. Sheet music. The refrain on its own would be good for kids. MV092 Like a Rock (Linnea Good) A lovely simple song (with actions!) from Linnea Good. Great for kids. 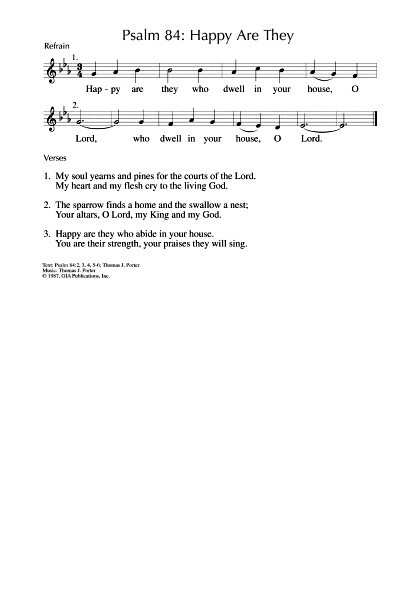 *Beneath the Noise How lovely is your dwelling place (Nicholas Randall) A lovely contemplative setting of this Psalm. The congregation could join on the refrain while a soloist sings the verses. Note to BUC: I have this book, published by Creative Ministries Network in St Kilda. Online Resource / Tune in The God that I Know (Sheree Anderson) A beautiful ballad with female and male images of a loving, embracing God. “He comes with his arms open wide, a sheltering place I can hide”. If this is not familiar to your congregation it would be a good song for a soloist. Free downloadable song book, sound sample and lyrics. Online Resource / Cry Hosanna How lovely is thy dwelling place (Jonathan Asprey) This is just gorgeous - set to the traditional tune "The homes of Donegal". Two very different versions available here (choral in the first link, and folky in the second). Lyrics, sample sheet music, and sound sample. Youtube. Thanks Mike for this suggestion. Joshua tells the Israelites their history and asks for their allegiance to God. The Israelites choose God despite Joshua trying to talk them out of it. TiS 687 God gives us a future (Elizabeth Smith) Great words to a very easy hymn tune. Careful not to let it get the tune get too pompous; the words are not! "God gives us a future, daring us to go into dreams and dangers on a path unknown. We will face tomorrow in the Spirit's power, we will let God change us for new life starts now!". Lyrics here (scroll down). 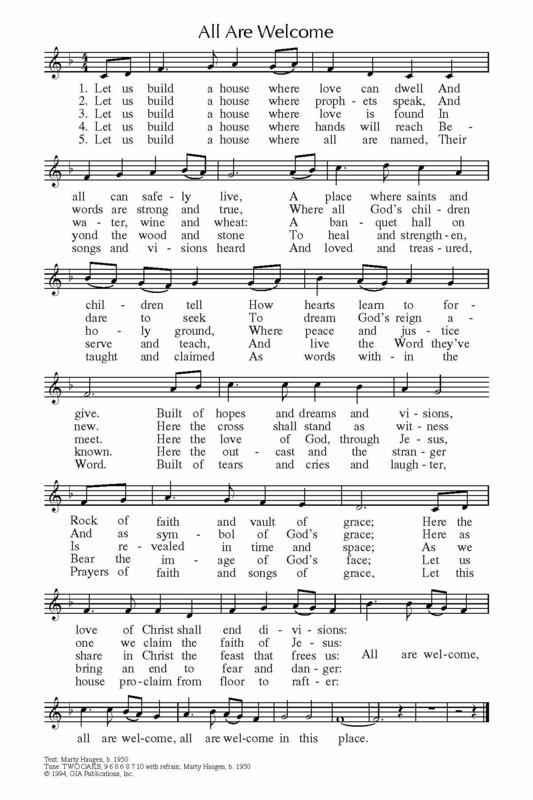 The hymn has been split into two parts to include the blessing and words of mission. *AoVK-29 Remember we are your people (Tony Barr) Simple three part chant "Remember we are your people, your people O God". This would work really well as a sung refrain during the prayer of confession. Good for kids. Slightly clunky sound sample. TOSB132 / NCH531 / CH542 / UMH463 / VU589 / LBW403 / ELW676 / A&M718 / HPP372 / GtG722 / PH426 / CP(E) 512 / W&R593 / LUYH754 / MP444 / VF098 Lord speak to me that I may speak / God speak to me that I may speak (Frances Havergal) Old fashioned hymn, with words of evangelism, and a reminder of the Israelites escape from Egypt with the mention of "feed thy hungry ones with manna sweet". Easy to sing and good, only slightly dated, words, depending on the hymnal. 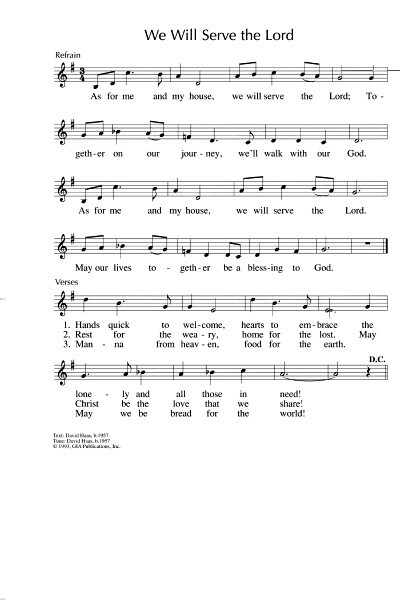 Lutheran sources have "Speak to us"
G(II)632 / GC869 As for me and my house / We Will Serve the Lord (David Haas) Quite nice song of hospitality and serving all people as guests. Clunky sound sample. Sheet music and lyrics. TiS 599 / AHB 520 / NCH448 / CH502 / UMH399 / VU506 / LBW406 / ELW685 / A&M787 / HPP349 / GtG697 / PH391 / CP435 / CP(E) 581 / W&R466 / Cha609 / Srce633 / 82Hml-707 / Lau874 / StF566 / LUYH863 / MP624 / VF133 Take my life and let it be (Frances Havergal) An oldy but a goody. Lyrics and information about the author. Oldy-but-a-goody. NCH408 / WoV782 / Cha088 All my hope on God is founded (Joachim Neander) Most translations of this well known German hymn are not inclusive, but these three translations are (BUC people, we have NCH). New words to old tunes. TiS 569 / AHB 478 / NCH18/19 / CH167 / UMH127 / VU651 / LBW343 / ELW618 / StF465 / A&M652 / HPP432 / GtG065 / PH281 / CP565 / CP(E) 455 / W&R501 / Cha622 / 82Hml690 / Lau960 / LUYH043 / MP201 / StF465 Guide me O thou great Redeemer (William Williams) A rousing hymn of God’s presence and strength and making it to the other side. "Bread of heaven, feed me now and evermore." Sound sample and lyrics. Oldy-but-a-goody. God hears the righteous and prevents fractures. *AoVK-24 / Iona (T1AU) / CH756 Bless the Lord (Kenyan) Simple and fun Kenyan call and response. "Bless the Lord there is no other God" Kids would really enjoy this, and with some African drumming, it would really be excellent. The tune is identical to Reamo Leboga. Sound sample of Reamo leboga (scroll to the 3rd album). Good for kids. Iona / CH788 / MV104 / GtG659 Know that God is Good / Mungu ni mwema (Traditional Congo) This traditional African refrain is just lots of fun and very simple to sing. Good for kids and adults! Lyrics and sheet music. ATOK 320 / NCH351 / VU645 / StJ / WoV770 / ELW732 /SFFS 2051 / GtG488 / HPP516 / W&R680 / Cha075 I Was There to Hear Your Borning Cry (John Ylvisaker) A song of God’s presence in all stages of life. Very simple tune to sing. This always makes me think of Center Church on-the-Green in New Haven, CT. Lyrics, and sheet music. TiS 706 / Taizé / AoV2-142 / A&M600 / SFFS 2013 / GtG544 / PH224 / GC(II)576 / G(3)620 / CP360 / Lau813 / PfAS103C / SP194 / Src79 / URW377 Bless the Lord my soul (Jacques Berthier) A beautiful and very well known Taizé chant. Sound samples, sheet music. Good for kids. G(II)44 / GC46 I Will Bless the Lord (Normand Gouin) A nice contemporary cantored Psalm with inclusive lyrics. Sound sample. Sheet music. TiS 73 / Taizé / CH77 / GA418 / GtG635 / G(II)364 / GC526 / GC(II)528 / G(3)623 / CP313 / Srce614 / URW384 / Lau698 / LUYH591 / StF778 Laudate Dominum / Sing Praise And Bless The Lord (Jacques Berthier) One of the more jolly Taizé chants. I prefer it in Latin, but for kids, this one is quite good fun in English. Good for kids. Sound sample and parts for learning. AoV1-083 / GA036 / GtG763 / G(II)46 / GC48 / GC(II)33 / G(3)047 / PfAS082B / URW257 / Lau892 The Lord Hears the Cry of the Poor (James Foley) The chorus for this makes a very good refrain for this Psalm, as set in PfAS. Sound sample and lyrics (including verses). Stand firm; Put on whatever will make you ready to proclaim the gospel of peace (helmet, shield stuff etc); Pray in the Spirit at all times. TiS 547 / AHB 455 / AoV1-009 / NCH451 / CH465 / A&M595 / UMH451 / VU642 / WoV776 / ELW793 / HPP353 / GtG450 / PH339 / CP505 / CP(E) 386 / W&R502 / Cha595 / Srce70 / URW180 / 82Hml-488 / Lau970 / LUYH859 / MP051 / StF545 Be thou my vision O Lord of my heart (8th century Irish, translated: Eleanor Hull) Most recent hymnals are fairly inclusive for this. Note that the High King phrase has been changed in some hymnals because it is masculine, but the hymn is based on an ancient story of St. Patrick refusing to follow the High King Logaire, and choosing instead the "High King of Heaven". Lyrics, tune and a little of the story. Oldy-but-a-goody. ATW 485 Praying in the morning (Treagus) Good song for kids about praying all the time. VU318 Christ be with me Christ within me (St. Patrick / Cecil Alexander) A simple refrain setting of St. Patrick's Breastplate. A good song for the end of worship. Did you know that Cecil Alexander was a woman? I only learned that a short while ago. NCH282 / UMH404 / HPP235 / PH315 / GtG066 / W&R481 / Cha592 Every time I feel the Spirit (African-American) There are a lot of versions of this song, so the lyrics vary in their inclusiveness. It's pretty good fun, though I'm not sure if many congregations sing it. TiS 623 Lord Christ true peace of all above (Brian Moore) A lovely, simple inclusive, and old fashioned, benediction song. TiS 642 / AHB 570 / VU410 / GA536 / G(II)547 / GC757 / GC(II)749 / G(3)856 / CP(E) 205 / URW185 / Lau673 This day God gives me strength of high heaven (James Quinn) There are a couple of possible tunes to this. I like BUNESSAN (morning has broken) best. The words are based on St. Patrick's Breastplate. One version of the lyrics. Oldy-but-a-goody. Tune in The people will perish without a vision strong (Shawn Whelan) A rock song about being strong in vision and courage. Free downloadable song book, sound sample and lyrics. More bread stuff: Christ in us, and we in Christ; You have the words of eternal life. Taizé / TiS 714 / AoV1-125 /ATE 270 / CH661 / UMH628 / VU466 / WoV709 / ELW472 / GtG527 / GA205 / A&M442 / G(II)588 / GC838 / GC(II)806 / G(3)941 / RS928 / CP063 / W&R697 / Cha414 / SP229 / URW379 / Lau633 / StF583 Eat this bread drink this cup (Robert Batastini / Taizé Community) Excellent, particularly if you have a capable cantor. Some resources say "Come to him and never be hungry", but others have "come to me / trust in me". ATW 498 / Iona (T1AU) / MV 196 / SP&P182 / URW438 We will take what you offer (John Bell) An excellent simple short song that works well either as an upbeat chorus or as a reflective chant. "We will take what you offer, we will live by your word. We will love one another and be fed by you Lord". Good for kids. Sound sample. FFS03 As we walk along beside you (Shirley Murray) Excellent words or recognising Christ in the word, the bread, the resurrection. A simple tune. Lyrics. MV192 We come now to your table Lord you are the living bread (Traditional Caribbean) Very simple communion chorus from Jamaica. This would be best with harmonies and lots of percussion, or I think it would be just a bit dull. Could be very energetic and celebratory! ATW 473 / Lau625 Bread for the world a world of hunger (Bernadette Farrell) Very nice words. Tune a bit schmaltzy, but the words save it. A bit gutsy really. Good for a soloist during distribution of communion, or as a reflective song. TiS 239 / AHB 185 / ATE 236 / NCH048 / StF252 / Lau746 / MP384 Jesus the Christ said "I am the bread" / Jesus the Lord said "I am the bread" (Anonymous - Urdu melody) This song set to a traditional Urdu melody is quite well nkown; translations vary a lot. I really like the translation in NCH. *AoVNG15 Bread of Life (Michael John Poirier) A nice gentle song; probably not so much a congregational song, but one for reflection. Would be good for distribution of communion. This was sung by the musicians on Maundy Thursday some years ago, and it would be good to sing it again. TiS 538 / AoV2-093 Feed us now Bread of life (Robin Mann) One of my favourite communion songs. Simple to sing, and beautiful simple theology. “Piece of bread, cup of wine, Lord this food is good”. Lyrics. Good for kids. MV197 Bread of life broken and shared (David-Roger Gagnon) Quite nice verses and catchy chorus, which refers to this, and other famous bread-like readings. For communion. ATW 472 / NCYC'99 As we take this bread (Jane Dyson) A lovely simple communion chant. VU250 / GA415 / G(II)372 / GC546 O God of Matchless Glory (Ruth Duck) Good song, simple tune. HASTINGS. Maybe more than one tune out there. TiS 430 / AHB 337 / Cha324 / StF164 Your words to me are life and health (George Currie Martin) I really like this old hymn. It’s a bit old fashioned, but it still works, I think. Oldy-but-a-goody. it's from the new collection of Brunswick Uniting Songs. We are hoping to put them on our website for free download soon!